“We had to wait a long time for this moment, fervently believing that it must come to pass. It is difficult to find words that express how we Poles feel” Polish President Bronislaw Komorowski said during the ceremony. The wooded site at Bykivnia is understood to be the final resting place of 3,435 Polish citizens murdered in 1940 on Stalin’s orders by the Soviet secret police (NKVD). 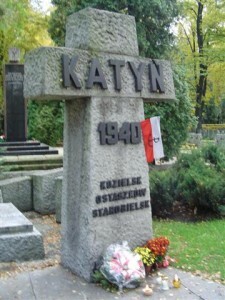 The executions were part of the broader Katyn Crime in which over 22,000 Poles – largely reserve officers – were killed in mass executions at various points across the Soviet Union, including the Katyn Forest near Smolensk. The final resting place of the Poles on the so-called “Ukrainian Katyn List” had long remained a mystery. In 2007, Polish archaeologists working at Bykivnia discovered the dog tags of Sergeant Jozef Naglik, as well as a comb with the names of four Poles inscribed on it. The names tallied with the so-called Ukrainian List, which makes up about 15 percent of the Poles executed during the Katyn Crime. Identifying individual victims has proved largely impossible. According to researched data, the mass burials in Bykivnia are the largest ones in Ukraine. Preliminary estimates indicate that during 1937-1941 more than 100,000 Ukrainians were also destroyed and secretly buried here.